A creamy, fast acting, dual performance mask designed to exfoliate, clarify, freshen and brighten the skin. Encourages cell renewal leaving skin looking more youthful, firm, plump and radiant. For all skin types. Alpha-H Liquid Gold Smoothing & Perfecting Mask (100ml) contains 15% glycolic acid to gently resurface and diminish the appearance of fine lines, wrinkles, age spots and scarring while wheatgerm oil nourishes and improves elasticity. Honey soothes and reduces redness and rose and lavender oil calms and heals, making this mask the perfect pre-party treatment or instant “pick-me-up”. It exfoliates dead skin cells whilst hydrating and plumping the fresh new cells underneath, leaving your skin visibly more supple, dewy and radiant. An aromatic clay mask which effectively draws out embedded toxins and impurities without stripping or dehydrating the skin. Contains anti-bacterial Lavender, pore cleansing white clay, Zinc Oxide to accelerate post-acne healing and Vitamin A to improve skin integrity. For all skin types, particularly dull and congested. I started using Alpha-H set in 2007, and it was recommended by a hair salon owner in Karamunsing Shopping Complex where I usually had my hair treatment. I had a problematic skin back then as I was very busy juggling between study and work. I never had time to look for my skin, and I usually didn’t get ample of rest, which resulted my skin condition to deteriorate. Thanks to the auntie who recommended me with this product. I finally got my ‘no-acne’ skin within 3 months. She suggested me to use both Alpha-H Liquid Gold Smoothing & Perfecting Mask with Lavender, and Purifying Clay Mask with Vitamin A. It leaves my skin super smooth, and gives it a beautiful glow. Glycolic Acid is used to treat all sorts of skin conditions from acne and scarring to pigmentation and wrinkles. I apply this once a week to remove those dead cells. It doesn’t leave my skin to become dried up and flaky. Has a really smooth consistency and you only need a thin layer to apply all over your face, and neck. It helps to eliminate enlarged pores, reduce redness, and can be used as an overnight blemish treatment. Lavender oil is anti-inflammatory, anti-bacterial, calms the redness associated with acne, refines pores and improves the health and circulation of the skin. I apply this twice a week after cleansing and exfoliating. My skin excretes less oil, appears matte, feels refreshed and purified. Simple, and very unattractive packaging. Not recommended if you have a very sensitive skin. It stings a little upon application, but it dries quickly. 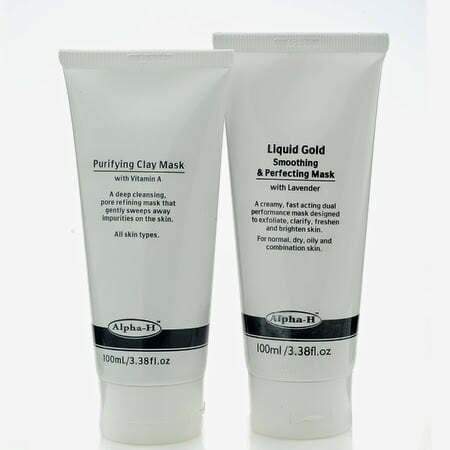 You can get a tube of Alpha-H Liquid Gold Smoothing & Perfecting Mask (100ml) from Luxola at the price of RM199. As for Alpha-H Purifying Clay Mask with Vitamin A, it’s not available in Malaysia yet. You should put this on your must have list before you even forget.